Travel theme: Fabric | Oh, the Places We See . . .
Well, we probably all have denim jeans. Ever since “who knows when,” they’ve become the staple of our wardrobes. And ever since “who knows when,” they’ve gone through several iterations from dark to washed to torn and now all the way back to raw. 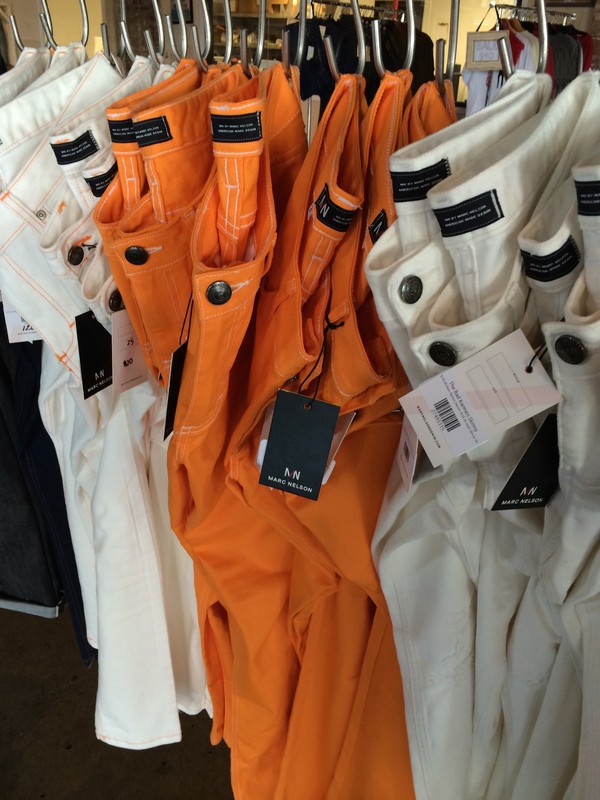 I’ve written before about Marc Nelson Denim, a relatively new Knoxville company that opened its doors for tours during the Dogwood Arts Festival. And it was then that I found out just how much I love the fabric of their jeans. Raw denim, it’s called. 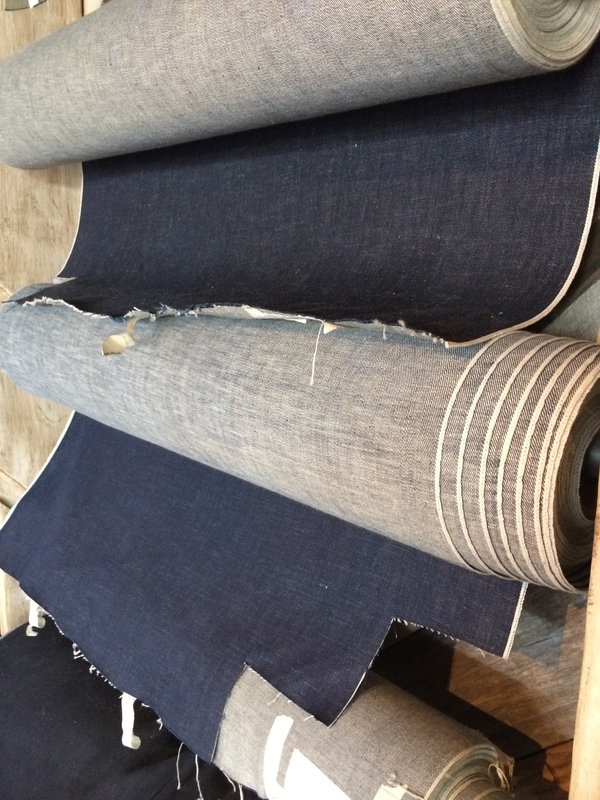 Rolls of raw denim at Marc Nelson Denim ready for cutting and sewing. But in this sea of blue denim, one fabric caught my attention: whiskey-dyed denim. 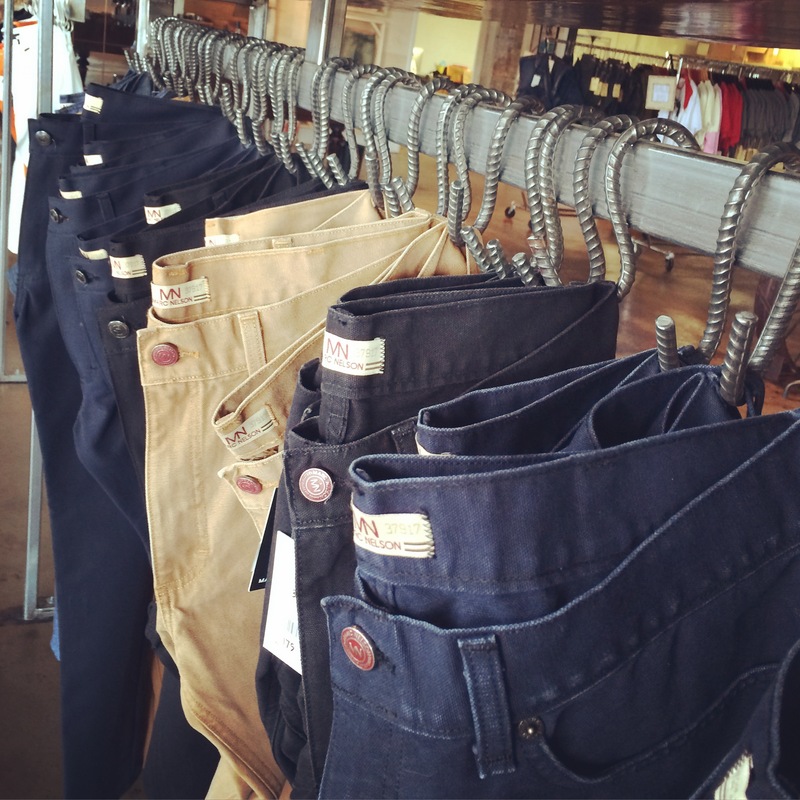 With a soft hint of amber, these jeans have been tinted with Smooth Amber whiskey– a color and process that may be unique to Marc Nelson Denim. As you know, however, we live in Big Orange Country, home of the Tennessee Vols. So, I suspect the fabric of choice, at least in the fall around here, would be anything orange or white. Orange and white jeans. Gotta have ’em in Big Orange country! 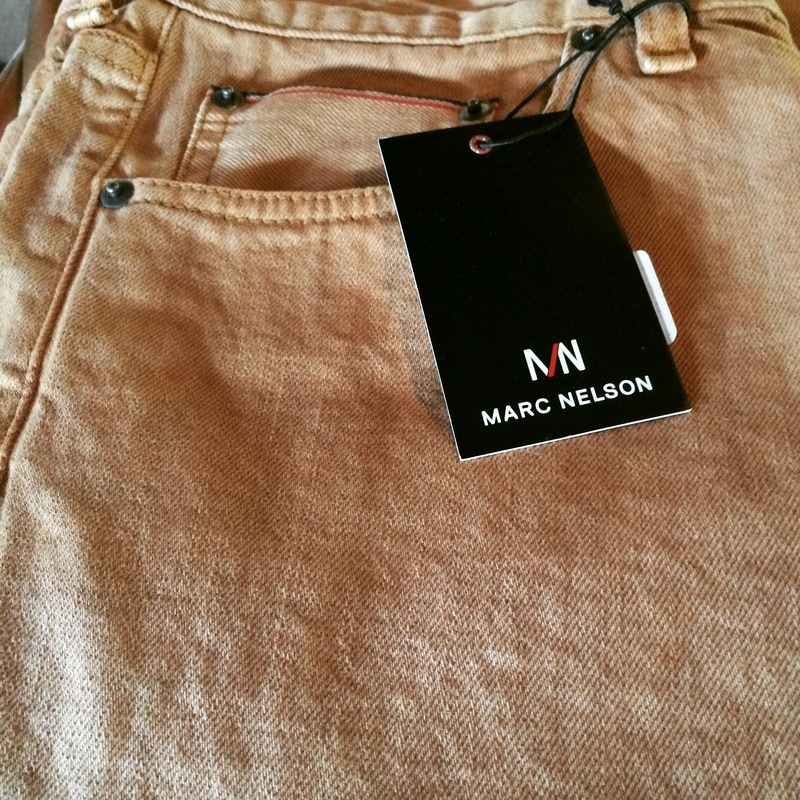 For more information on Marc Nelson Denim, click here. For more fabric stories and shots, head over to Ailsa’s blog Where’s My Backpack for this week’s Travel theme: Fabric. I agree, Judy. Maybe we’ve just been brought up to toss it all into the wash. At any rate, it’s been interesting to think about! Happy holidays! I agree. The website said you could poke dryer sheets in the pockets if the jeans smell. But I still have that urge to throw everything into the wash! Happy holidays! I’ve never heard of not washing your jeans, but I have heard of putting them on straight out of the washer and letting them dry on your body for a more conforming fit. You certainly wouldn’t loose someone wearing those orange jeans! You’ve brought up something that’s mentioned on their site: taking a shower with the jeans on. I’m not sure how that would feel, but it would satisfy my need for clean jeans! Happy holidays! 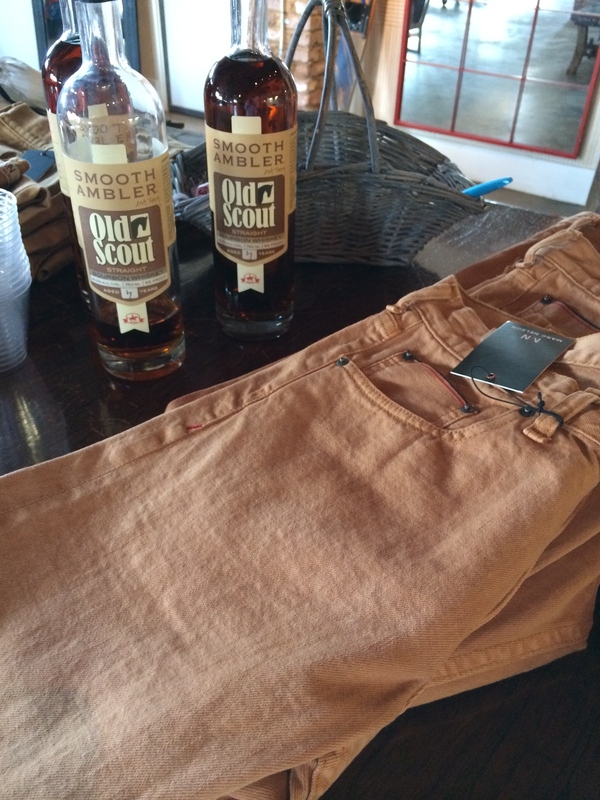 Agree the whiskey denim is very cool. But also agree, not sure I could go forever without washing!! I’m much too clumsy than that – spills happen! Couldn’t agree more. I would have to wash. But then, that might ruin the fit. But it’s an interesting concept, one I hadn’t considered before touring this place! Happy holidays! I like the amber whiskey color! It is kinda interesting! But I’m not sure I could never wash my jeans. I love the colors and feel, but still thinking about whether or not I could go forever in the same pair!! Thanks for commenting. Hope your holiday celebrations are coming along nicely.